we are known for high density Bi Metal Threaded Contact (high grade), counted amid one of the credible market names, we are offering to our customers a distinctive variety of Bi Metal Threaded Contact . Easy to use, long lasting and highly reliable, these are widely used and demanded in the market. More to this, these could be availed from us at market leading rates in different size stipulations. These are used in electrical accessories electronics components and relays and other products where conductivity is required. Resistanceless Conductivity with reasonable rates. Long life of Silver & Bi metal Contacts with exact layer of Silver Composition. Established in the year 1990 Contactwell specialized in high Density Bimetal rivet and Bimetal threaded contacts, Bi Metal Contacts, made in AgCD oxidized and Ag (Ni) As per customer requirement. We make castor wheel bolts, weld bolts and studs, machine screws, self tapping screws, hollow rivets and semi tubular rivets. We are in manufacturing of stainless steel screws, bolts, nuts, weld bolt also. These Product are made as per known standards or as per customer specific drawing and any type Of special fasteners, we can make even non standard items also in any metal. 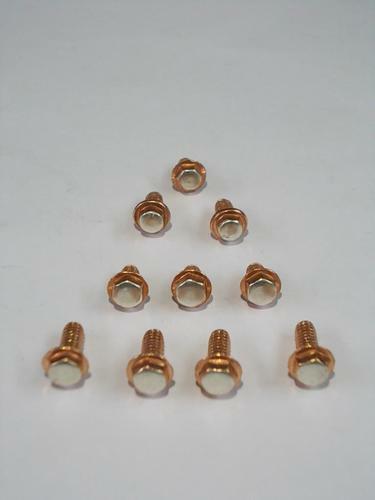 Copper and silver rivets and contacts for electrical and electronic assembly,made with best conductivity material.